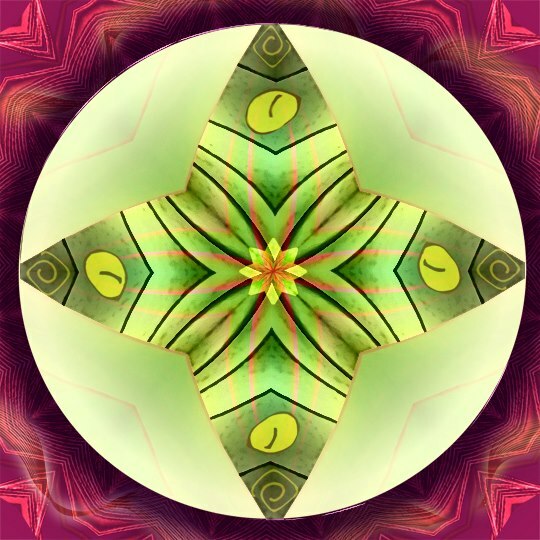 The beautiful artwork of Digital Artist Sue O'Kieffe has inspired and aided in the healing efforts of many who admire her work. 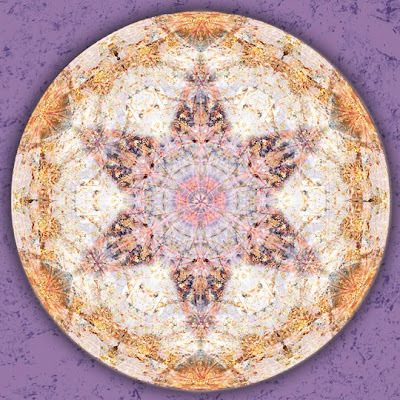 Her ongoing passion in working with the Mandala form and also in the healing properties associated with Auralite crystals definitely piqued my interest - prompting me to find out more about this wonderful artist and her spiritual and artistic world. Enjoy! MBS: Can you tell us a little about yourself? How did you get started in art? Sue: I have been creative all my life. I'm sure I came into this lifetime having been creative in many others. And I bet I will be creative in future space-time continuums as well. I expressed to my mother around the age of five that I wanted be an artist when I grew up, and my creativity was encouraged to a certain extent, but there was an underlying message also of not being good enough. Having talked to other creatives, I know that this has been a common theme for many. My journey as an artist has seen me embracing many different media -- starting with embroidery, knitting and crocheting. In my 30's I was captivated by beadwork and beaded embroidery, jewelry making, and bead making with polymer clay. All of these media had similar things in common. They were all tactile, they all involved working with pattern, and they all involved working with wonderful colors. In my late 30's and into my 40's I began learning more about the healing power of colors and incorporated that knowledge into my art as well. Somewhere along the way, working with teeny tiny beads began to take its toll on my eyes and my body and I began looking for new ways to express myself. In the mid 90's I became involved with a group of women interested in the medium of collage. We met twice a month with the intent of making collage as process rather than product in a safe non judgmental environment. It was what I would see now as my first experience of creating art within the confines of sacred space and the Divine Feminine. These bi-monthly meetings were magical to me. I loved the respect and safety of the group. We met for four years and eventually even had a couple of group shows. One of the women in the group had a computer and an early version of Photoshop. I went to her house to play one Saturday afternoon, and the moment I put my hands on the keyboard, I knew that creating digital art would be where I would go next. It took me a while to get there, though. In 2005, I went back to school to learn digital media and all things Adobe. I took a couple of classes in Photoshop from an art instructor who encouraged process and learning over perfection and product. By the time the classes were over I was finally calling myself an artist. I was 55. MBS: I've talked to so many women artists over the years who have come into their creative life in their 40's or 50's - I've also heard many reasons why. What finally clicked for you once you become older? Sue: Wow, that's a great question, Diane! The first thing that came to mind was Anais Nin's quote :And the day came when the risk to remain tight in a bud was more painful than the risk it took to blossom. At this point in my life both of my parents had passed. I didn't need to be concerned with taking care of them any longer. I had no children to finish raising either. I only had me to finish raising! I think the journey of menopause was also an ingredient. I remember reading in Christiane Northrup's book The Wisdom of Menopause that this is the time when women either heal the wounding of their past and move on to who they want to be or they run the risk of many health issues later in life stemming from these unhealed places. I just felt driven to create like I'd never felt before. I was on fire! And I felt a creative freedom I'd never experienced before either. I loved working digitally. It was magic. Everything was lining up. I was coming home. MBS: What is it that you find so satisfying and engaging about making art digitally? Sue: The only way I know how to answer this question is that creating digitally is what I love. I go with what fascinates and with what I find compelling. Who knows why this is? I just know that when I sit down at the computer that I feel a oneness that I don't feel with other approaches. 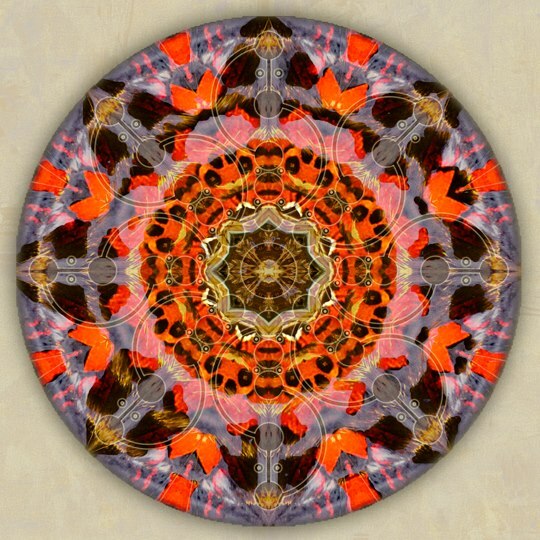 And I especially feel that oneness, as well as a lot of magic, when creating mandalas digitally. I'm entranced! MBS: A lot of your work revolves around the creation of Mandalas. How did your interest in the Mandala form come about? Sue: As a little girl I loved rubbing my eyes and enjoying the colors and patterns created behind my closed eyelids. My earliest memory of what might be an introduction to mandala making was playing with a Spirograph that my mother had saved from her own childhood! Fast forward another 15 years or so to discovering a mandala coloring book and coloring the designs, which I loved. But my first real experience with mandala making occurred around 1997. I participated in a workshop led by a woman who had been trained by Judith Cornell. Cornell created a lovely and very powerful approach to mandala creation based on the concept of drawing with light by laying down layers and layers of white prismacolor pencil on black paper before adding subsequent layers of color. That weekend was powerful and transformative and one of my first conscious experiences of connecting with the Divine through art making. I loved creating within the container of the circle. 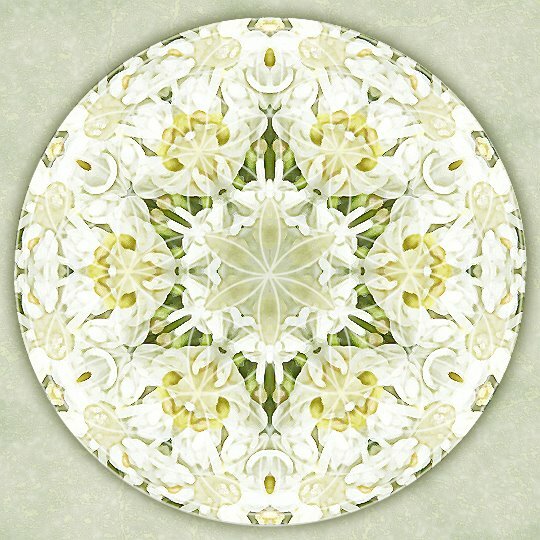 When I purchased my first computer a couple of years later, I spent lots of time searching online for and being inspired by mandalas created in the digital realm. 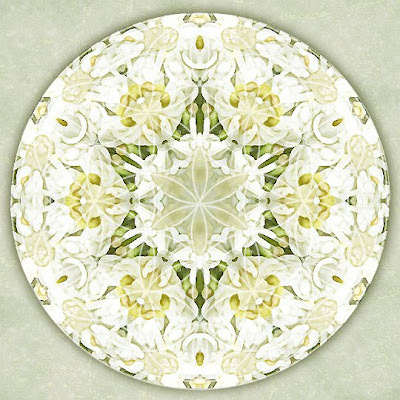 I discovered Komra Moriko's work on earthmandalas.com and knew deep inside that I would create mandalas based on the beauty of nature. She was so generous to provide a step by step tutorial on her website. During the summer of 2005 I immersed myself in this learning process and haven't stopped. Being out in nature and filling my eyes with her beauty, capturing it all on my camera, and then bringing her gifts home and transforming it all in photoshop is a deeply nourishing and fulfilling process. 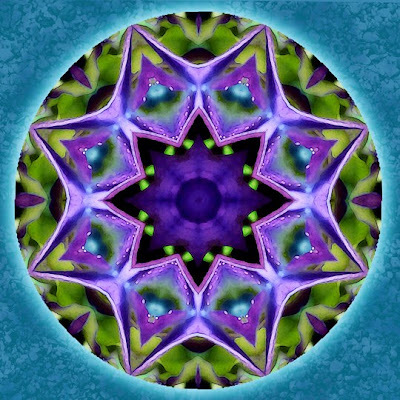 I know that I came into this lifetime to be part of some amazing planetary changes and to create mandala art to assist humanity with these changes. MBS: Your work is very spiritually oriented. How does spirituality play a role in your artwork and for you as an artist? Sue: As far back as I can remember I have felt connected to Spirit. Sometimes I forgot. Often fear would get in my way. I have always been a seeker. There have been pivotal moments in my life when I clearly came in touch with the Divine, far too many to talk about here. I have always listened to the promptings of my soul and followed them, even when I didn't realize that's what I was doing. Spirituality has always been entwined with my art so I really can't imagine creating any other way. Currently, a big part of my journey is developing a deeper co-creative relationship with my inner guidance in my art making. In meditation I've been asking what most wants to come through at that moment, wait for imagery and listen for the words Spirit shares. 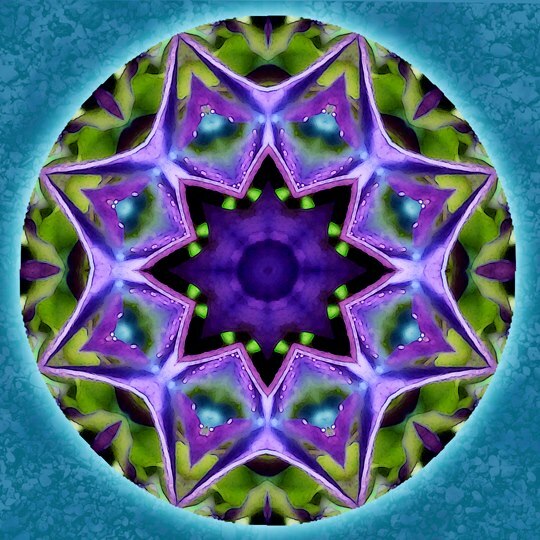 And then I interpret what I see and hear in mandala form. I am learning that this listening takes a bit of patience, as well as faith. My ego natters at me about making it all up. But I love creating art in this way, taking a step away from the limitations of my creative mind and allowing Spirit to guide me and speak through me. I look forward to creating these intuitive mandalas for others as well, using the same process, as a testament to the receiver's spirit. MBS: I've noticed recently that some of your work has been based off of Auralite Crystals. 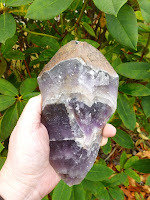 What is an Auralite Crystal, it's properties...and how did you become introduced to them? Sue: Auralite is conservatively estimated to be a 1.1 billion year old crystal found only in a remote region of Ontario, Canada. It is comprised of amethyst, clear, smoky, and citrine quartz, along with more than 23 other mineral inclusions (including gold, silver, platinum and copper) and 35 elements that have all been confirmed by geological assay. I first learned about this crystal in 2006, before it was even being called Auralite. I had just been diagnosed with a non malignant tumor that was wrapping itself around my carotid artery. Through the magic of the internet (and Spirit), I had serendipitously connected with the man who is now the mine's project geologist. He wanted to talk about this crystal and I was very happy to listen. The photographs of the Auralite he shared reactivated my childhood attractions to the mineral kingdom. 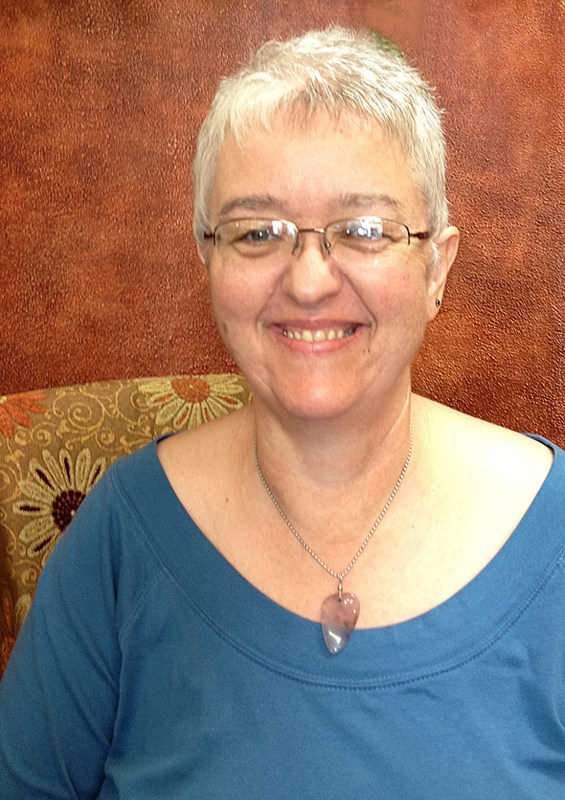 The energies from the crystals helped assist me during this somewhat challenging time. This was the beginning of my spiritual awakening. Fast forward to early 2011. My geologist friend and I reconnected on Facebook. He asked if I wanted to help sell Auralite, and I said yes. Over the past year I have come to understand that being an Auralite advocate and caretaker is also part of my life calling. Because this is a new crystal to humanity, those who are connected to Auralite are the ones discovering its properties. I ask people to share their experiences with me. It's fascinating to hear these Auralite stories. My belief is that Auralite is coming to the surface now to assist humanity during these challenging shifts in energy as we move into higher states of consciousness by clearing out lower energy levels that no longer serve us. My personal experience with Auralite is one of amazing unconditional Love. It creates a magnetic bond with those it connects with. I've seen people not able to put it down. And I've experienced tsunami waves of Love wash over me from this crystal. I am such a fan of Auralite, because I have seen what it can do. It forms a very personal connection with the client and immediately targets what parts are out of alignment, working to clear blockages. I have seen it cause emotional release, instant activation and clearing of the chakras in less than five minutes, sudden insights, activation of the client's blueprint, and the ability to clearly tune into spirit. It is very good at treating emotional and mental ascension symptoms as it unwinds areas of constriction, bringing relief of stress, anxiety, tension, anger, and other lower emotional states. Auralite naturally awakens the third eye, helping both you and the client tune in and achieve a higher meditative state. It also strongly resonates with St. Germaine and the Violet Flame energies. Therefore, it is perfect for transmuting any lower energy into pure light. If you could only have one crystal in your healing tool box, Auralite should be it! 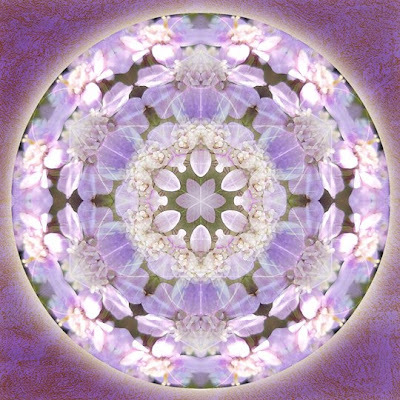 I began creating mandalas from photographs of Auralite not only as a way to honor the crystal, but also as a way to share the crystal's unique energies in mandala form. MBS: What is a typical work day like for you? Sue: Like many artists, I also have a part time day job. I approach that with the intent of being an embodiment of Light and Love. Really, we can all spread joy and light wherever we go. This isn't about being Pollyanna. This is about being present and available to the best of my ability and engaging with people with consideration and respect. This is how I do my art when I am not "doing my art." There really isn't a "typical" work day for my art. I do what most needs to be done, whether it is creating new art, being in nature with my camera, working on a commission, or maybe even trying out a new recipe. Staying properly nourished for my body's optimum health is important to me these days.I have recently decided to return to a vegetarian diet. When I am focused on making art, I block out a period of time to do just that. I meditate for a period of time to see what most wants to come forth, and then I sit at my computer and listen to my guidance. I shared a bit about my process on this blog post recently. And then, of course, there is time reserved for Facebook. Sue: My immediate focus is preparing for an art opening on January 5 at Humboldt Herbals in Eureka, CA for our community's monthly Arts Alive. I've also been invited to show one or two of my mandalas at an international art show of mandala makers in September 2013 at Nails in the Wall Gallery in Metuchen NJ. In between this, I am planning on writing an article for a local metaphyiscal newsletter about my True Self Mandala process. MBS: What are your True Self Mandalas? Sue: Over the past couple of years I have been developing a process for creating portraits of the True Self in mandala form.In 2009, when I wanted assistance in creating commissioned mandalas, I sought out the counsel of a local shamanic practitioner, who journeyed with her allies and came back with the suggestion to connect with the True Self, ask specific questions, and then interpret the information received in mandala form. 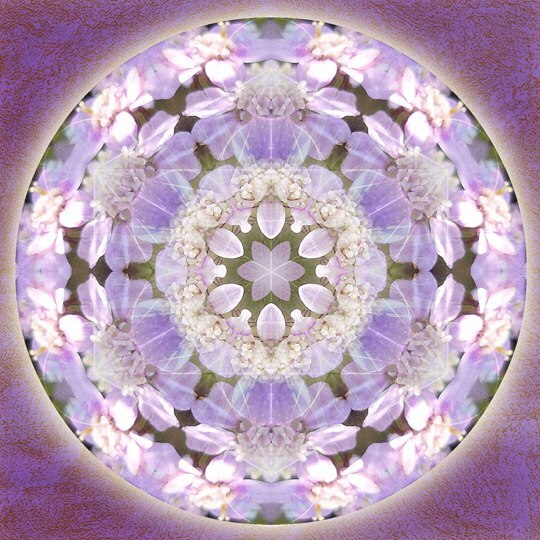 My first assignment was to create my own True Self Mandala, which took me, for various reasons, about a year to create. How could I create for another without knowledge of my own True Self? Since then I have had the honor of connecting four other women with their True Selves and creating their individual True Self Mandala using this very soulful process. It is a powerful and healing process for the receiver as well as for myself, and such a lovely way to honor your spiritual journey in a very intimate way. MBS: I see that you sell your work on-line. What has your on-line experience been like? Sue: The first week after I opened my Etsy shop in 2009, someone placed an order for six of my mandalas. It was a great, encouraging way to get started. Overall, though, online sales have been fairly sporadic. In 2013, I want to look at other venues besides Etsy as well as finally put up my website. MBS: What advice do you have for anyone who wishes to (seriously) pursue an artistic path? Sue: Ask yourself what you want to be doing in the next five years. Look for business support within your community. I have been happy with the local Small Business Development Center, which has provided me with a business coach and many classes about different facets of business, all at no cost. Find someone whose wisdom you respect to assist with art marketing practices. Talk to lots of other artists, whether it is in online groups or in your local community, for advice and support. Get your art out there. Be willing to be transparent and share yourself with people. Be patient. Be grateful for those around you and tell them that on a regular basis.Love and appreciate what you do. No one else does what you do. The world needs you. I like this quote from Earl Nightingale : Never give up on a dream just because of the time it will take to accomplish it. The time will pass anyway.